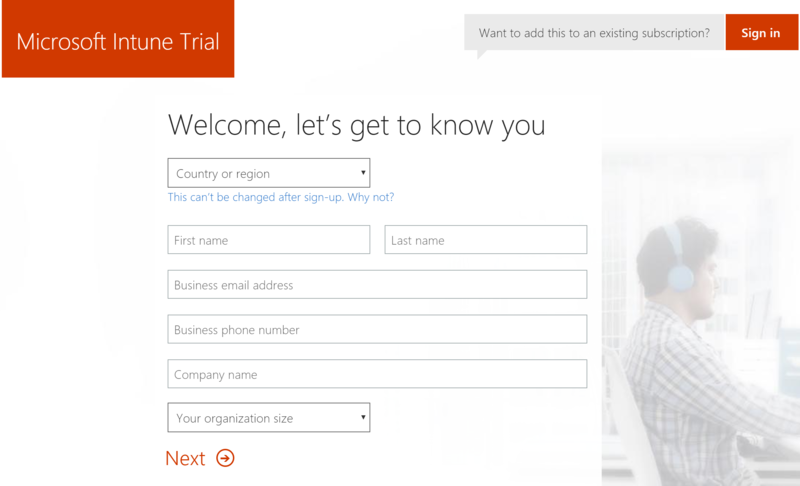 This topic tells system administrators how you can sign up for an Intune account. Before you sign up for Intune, determine whether you already have a Microsoft Online Services account, Enterprise Agreement, or equivalent volume licensing agreement. A Microsoft volume licensing agreement or other Microsoft cloud services subscription like Office 365 usually includes a work or school account. If you already have a work or school account, sign in with that account and add Intune to your subscription. Otherwise, you can sign up for a new account to use Intune for your organization. Visit the Intune Sign-up page. On the Sign-up page, sign in or sign up to manage a new subscription of Intune. After you sign up for a new subscription, you receive an email message that contains your account information at the email address that you provided during the sign-up process. This email confirms your subscription is active. After completing the sign-up process you are directed to the Microsoft 365 admin center, used to add users and assign them licenses. If you only have cloud-based accounts using your default onmicrosoft.com domain name, then you can go ahead and add users and assign licenses at this point. However, if you plan to use your organization's custom domain name or synchronize user account information from on-premises Active Directory, then you can close that browser window.